A one-day theory and practical workshop on the basic care and preservation of photographs was organised and hosted by the University of St Andrews Library, Special Collections Division. The workshop was held on Saturday the 20th October 2018 as part of the St Andrews Photography Festival and Stereo Photography conference. 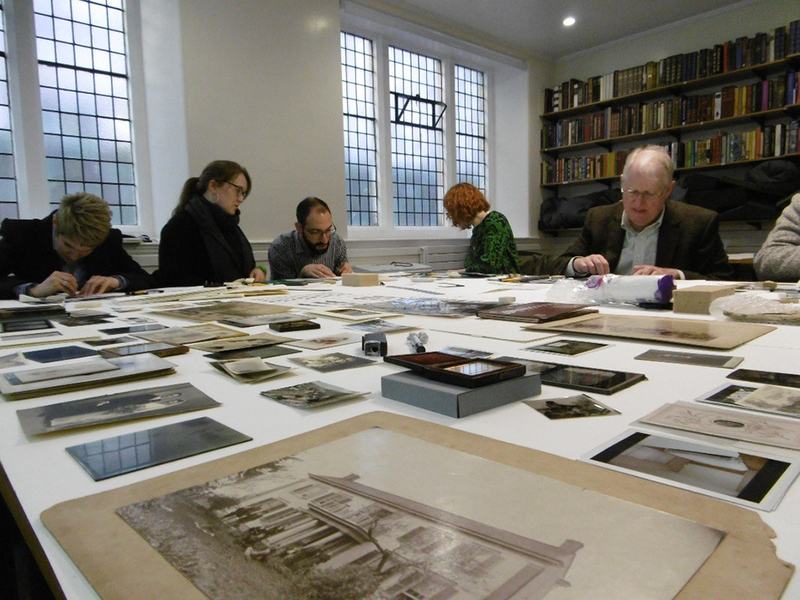 Led by Ioannis Vasallos, the photographic collections conservator at the National Library of Scotland, the workshop was geared towards collectors and curators of photographic collections. Delegates were taken through the history of photographic processes and shown the characteristics of each process type, which can aid their identification. The descriptions of the different processes and their development was used to introduce the common types of deterioration associated with each process type. The session was followed by an identification test using Ioannis’ extensive study collection, which includes a variety of photographic processes from albumen prints varnished with collodion to Polaroids – some more easily identifiable than others! There was lively discussion throughout the identification test and the participants shared collection care problems which they have encountered with their own collections. The next session focussed on the safe handling of photographic material and an introduction to basic conservation treatments including: surface cleaning, and removing pressure sensitive tapes and staples. Black and white silver gelatine photographic prints on resin-coated paper depicting the monuments on Calton Hill in Edinburgh, had previously been stapled and covered with pressure sensitive tape and were used for the workshop as mock up collection items to be treated. Dry cleaning was demonstrated using a washed latex make-up sponge, a blown latex sponge, grated Mars Staedler plastic eraser 526-50 and a Prismacolor MAGIC RUB® eraser. Delegates tried their hand at the cleaning and at pressure sensitive tape removal using a blade, micro-spatula and a crepe square. The practical session introduced the participants to new skills while at the same time making them more aware of the skill and experience needed to carry out even simple interventions to photographic material. Preventive conservation was covered in the session on display, housing and storage. Ioannis’ comprehensive presentation was well supplemented by physical examples of options for housing formats to suit different items, from ready-made four-flap enclosures to archival ring binder files with polyester pockets, and a huge range of samples of suitable materials for housing photographic material – these included samples of archival cover paper, unbuffered museum boards, pHoton paper, Argentia, archival polyester and Plastazotes. Recognising that not every problem can be addressed in-house especially in smaller institutions which cannot afford conservation staff, the final session covered commissioning conservation from private conservators. Delegates were informed about the Institute of Conservation, the process of Professional Accreditation and continued professional development and the Conservation Register as a resource for finding a qualified and accredited conservator. The importance of photographic and written documentation to an item’s description and condition, and most importantly, full details of any interventions and changes made was strongly emphasised. With the well thought out structure, Ioannis’ enthusiasm and knowledge and the excellent resources to support the event, the workshop was a unanimous success and will certainly be repeated in the same venue. Please look out for notifications of the next workshop. The organisers would like to thank the sponsors for the huge variety of materials and samples generously provided by: Conservation Resources, John Purcell Papers, Preservation Equipment and most especially Conservation by Design. The event was also made possible through generous funding from the Icon Scotland Group which works tirelessly to promote and strengthen links between the variety of conservation disciplines in Scotland.